I predicted that Saturday would be dramatic but I never imagined what a rollercoaster of emotions supporters of Welsh, Irish and English rugby would go through. 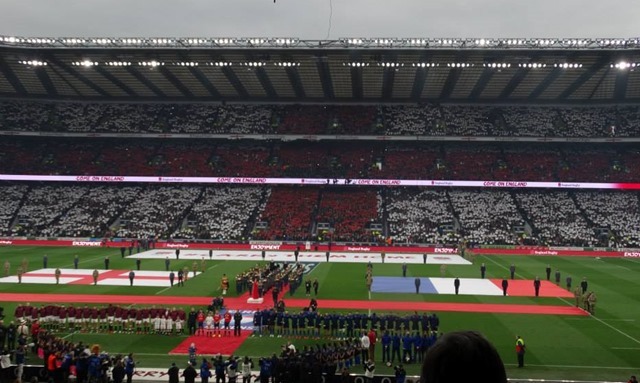 I was at Twickenham all day and witnessed the hope and the anguish on the faces of people there and I am sure that was repeated in rugby clubs all over England. Italy’s half time lead seemed to have put paid to any hopes of Wales winning the Championship but a ruthless second half saw the men in red lay down a marker that had Englishmen worried; could they beat the French by 17 points when they had not done so for decades? By the time the game in Edinburgh started there were several thousand in front of the giant screen in the West Car Park at Twickenham to see if England’s job was going to be made any harder. Once again, the half-time score flattered to deceive and the Irish scored 20 second half points leaving England with a mountain to climb. It is fair to say that the mood around the stadium was pessimistic but you would not be surprised to hear that many were relieved that the Welsh were now out of contention. 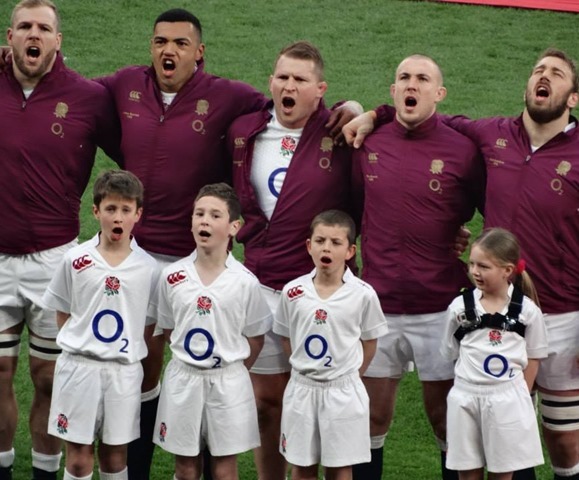 I was particularly interested in the pre-match anthems as the England team Mascot was Jack Blackham (on the left in the picture), a young player from Wymondham RFC in Norfolk, and I am delighted to report that he gave the national anthem everything. Then the match kicked off and I witnessed the most remarkable game I have ever seen at Twickenham. A brilliant start for England which sparked some hope that maybe they could get the 27 point win they needed. But within 15 minutes that hope turned to despair as France scored two tries to lead 15-7. Then England did what they had promised to do the whole series, making breaks and converting them into points, with the French playing their best game of the year throwing the ball about and demonstrating their Gallic flair. As play went from end to end the crowd were mesmerised and gave full voice to support their team, and when in the last ten minutes it looked like the impossible might happen, the atmosphere was frantic. As Jack Nowell went over to leave England a converted try short of the championship, the stadium became a sea of noise and when the final 13-man maul edged towards the French line in the last minute every Englishman in the stadium wanted to run on the pitch and join the shove. The French played their part by playing to type and rather than take the easy option and kick for touch they still tried to run from their own line. It was a thrilling game for fans and spectators, but at the post match dinner the England players were devastated and exhausted. Ben Youngs looked out on his feet when I spoke to him and he admitted he was completely drained (although his actual words were more colourful!). A memorable day made all the more so by my guest, Erika Roe. I introduced her to as many people as I could, some of whom had asked to meet her beforehand, but it was great fun to see the double take as I said her name. 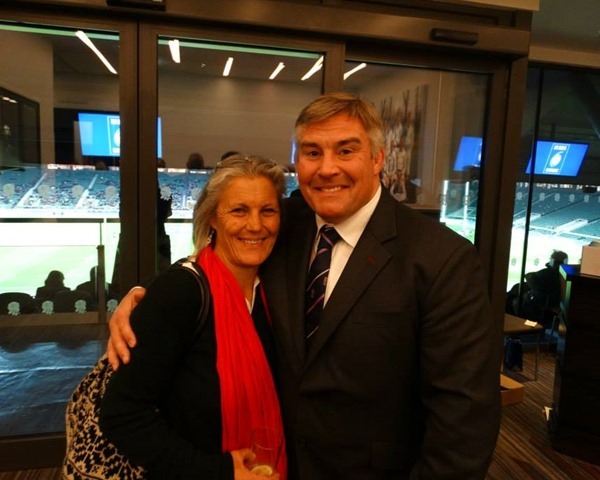 I know Erika enjoyed the day despite not knowing that much about Rugby; when she met Jason Leonard she had to confess that she didn’t know who he was but he was clearly delighted to meet her. So another Six Nations ends and yet again England finish second, but for my money they were the best and the most entertaining team and will have learnt from every game they played. There are three warm up games before the World Cup starts on 18 September and I am still firmly of the opinion that England will make it all the way to the final.